It’s our job to understand our client’s vision, to work out what function (and fun) this garden will bring to their lives and to turn pencil drawings into perfect permanent landscapes. 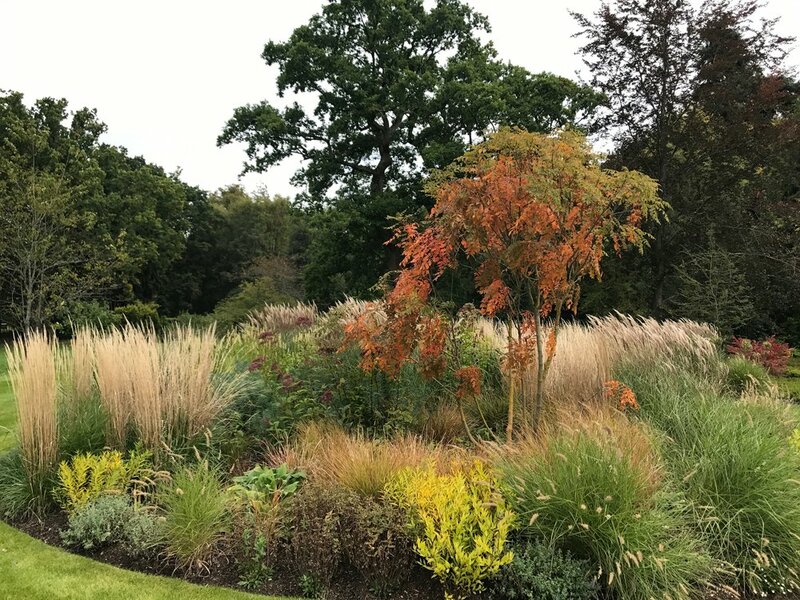 In June 2017, we put the finishing touches to our most ambitious project to date, a five-acre Ascot garden – transformed from swampy building site to serene sanctuary over two years. One of the major excavations in the early stages of the project was the removal of the garden’s most prominent feature – an overgrown tennis court surrounded by 25m of 15m high leylandii. It took a fleet of 20-tonne muck-away lorries, multiple 14-tonne diggers and tracked dumpers to level the surface – and two days to remove the towering trees. We designed a series of island beds, which would subtly divide the expansive lawn and create mystery. These acted like an ‘entrance’ to the rest of the garden with plantings that included large clusters of winter flowering heathers and shuttlecock ferns, as well as ornamental grasses that mirrored the plantings on the terrace and the meadow beyond, interspersed with specimen trees and shrubs. Driveways are always a crucial part of any garden design – after all, it is the first thing visitors to the house will see. We were keen to take account of the woodland nature of the setting, with plants that could thrive in those conditions and continue to support the huge amount of wildlife. Our designs take in the great and the small, and our smallest design – a 12m by 12m contemporary garden in Cambridge – posed lots of juicy challenges. The brief was to create a low maintenance but striking garden with a separate sun terrace and noise reducing boundaries. To soften noise and pollution from a nearby road, we pruned yew trees on the boundary to thicken them up and planted a row of pleached holm oak. Ivy panels inset from the fence provided instant screening and concealed the boundary. Slatted cedar panels were used to disguise the fences. The modernist style of the house was taken into consideration when it came to the design of the terrace and the contemporary planting, which included architectural tree ferns. To maximise views, we extended the terrace directly from the kitchen’s by-fold doors and used the same material for the external and internal floors. The same colour flooring was used for the sun terrace but large black slate was used instead of ceramic tile. The sun terrace was a very warm location in the garden and we surrounded it with agapanthus and gaura for summer impact. A Corten steel bowl was used as a focal point and underplanted with Hakkonnechloa grasses. The planting scheme for the garden contained flowering plants such as Astrantia mixed with exotic foliage such as Fatsia japonica and ferns. We also used Anemanthele lessoniana, a very handsome evergreen grass that turns a lovely orange colour in the winter.